Rarely is Brinsley Tyrrell as content as when he’s rambling around with his two playful German Shepherds through the lush yard and wooded trails of his Freedom Township farm. Those restorative jaunts are also one of his greatest sources of inspiration. It was back in 1972, when Tyrrell was hired by Kent State University (KSU) to head the sculpture department, that he and his late wife purchased the property just in time to save the decrepit 1860s farmhouse from the bulldozer. 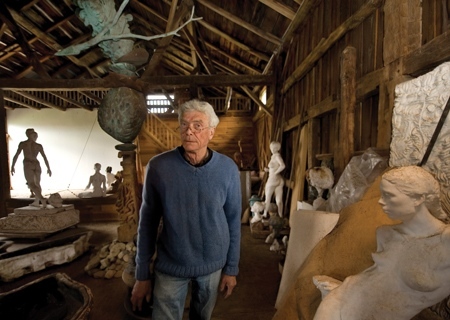 They lovingly restored the house, rebuilt a barn they could both use for studio space, and converted a dairy barn into more storage and studio space for Brinsley’s larger sculptural works. (Lilian Tyrrell, whose arresting tapestries were inspired by more disturbing aspects of the same countryside, was to win the Cleveland Arts Prize in 1992.) More recently, Brinsley and a friend have built a kiln to fire some ceramic pieces Tyrrell had in mind, along with a chicken coop to house the box of chicks they purchased somewhat (he admits) impetuously. Although he thinks of himself primarily as a sculptor who works with clay, wax, plaster, bronze, wood or stone, Brinsley Tyrrell has found himself in more recent years creating a number of stunning, multi-hued enamel paintings, some of which were first shown at the William Busta Gallery. It was a series of large public commissions, he says, that led him to begin exploring other materials; he first became interested in enamels in 2007, when he was using KSU’s large-scale enamel kiln to complete a commission for Cleveland RTA’s W. 117th Street station. Together with blacksmith Steve Jordan, Tyrrell has completed a number of wrought iron sculptures, fences and gates, many of which are in the Cleveland area. His fascination with shaping and sculpting go back his youth. As a young boy in Surrey, England, he was constantly molding objects out of plasticine clay. At 14 he was enrolled in a school out in the Dorset countryside, where one day in a sculpture class he was handed a block of alabaster and shown how to use various chisels. Young Brinsley began carving while his teacher, who had placed a paper hat atop his head to protect his shoulder-length hair from the dust, sat in the corner and played the cello. (“He was a wonderful guy,” Tyrrell remembers. “In fact, he lived to be 102 and was making work the whole time. He was the first artist I’d ever met, and I felt like, ‘Wow, you can actually do this for a living?”) Within 20 minutes Brinsley Tyrrell knew he wanted to be an artist. He went on to the Camberwell School of Arts and Crafts at the University of London, where he received a major grant from the Middlesex County Council and earned his Intermediate Degree in fine arts in 1961 and a National Diploma in design with a major in sculpture and a minor in terracotta in 1964. He and Lilian (who together would win a Governor’s Award for the Arts in 2002) decided to move to the U.S. with their two small children just for a short-term adventure. They lived in New York for a year, and then while searching for a teaching position, Brinsley was hired by KSU to replace a professor who was on sabbatical for a year. Kent State liked his work so much he was given a full-time faculty position. Several years later, perhaps a bit homesick, the couple moved back to England; it soon became obvious to Lilian, however, that Brinsley wanted to be in America. While he was prospecting for a job in California, KSU called him with a very enticing offer: Would he be interested in replacing the head of the sculpture department, who had unexpectedly resigned. Tyrrell was to run the department for the next two decades.